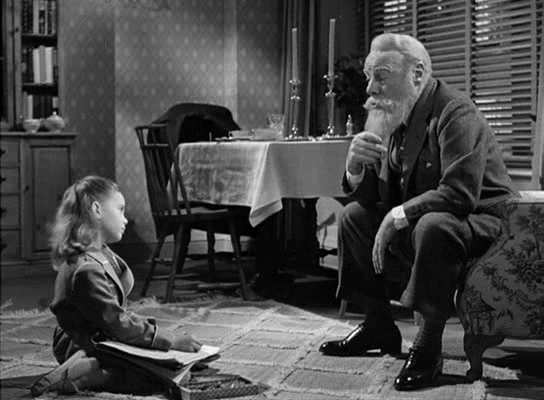 A cynical young girl (Natalie Wood) who doesn’t believe in Santa Claus befriends an older man (Edmund Gwenn) who claims to be Kris Kringle himself. Peary lauds this heartwarming family favorite as a “marvelous adaptation of Valentine Davies’s [short story],” noting that it’s appropriate “for children and adults (who will better appreciate the social satire) — every Christmas season”. He accurately notes that the film possesses “excellent acting down to the smallest parts”, as well as “off-beat humor, sharp satire, tremendous warmth, and scenes that will have you choking up”. 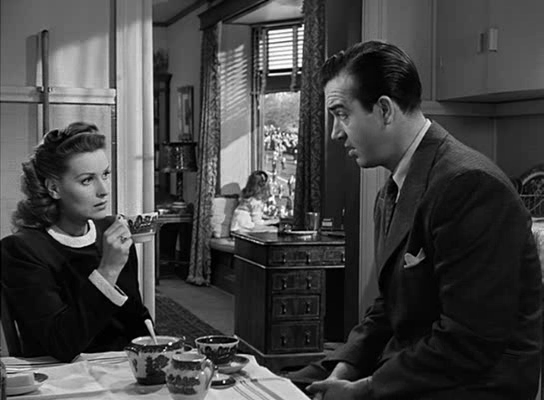 He argues that George Seaton’s “intelligent, skillfully plotted Oscar-winning” screenplay “zeroes in on the American character”, given that the film’s characters have “become so ambitious in their careers, [so] power-hungry, and [so] interested in money, that they have suppressed their finer values” — just in time for Kris Kringle to show up and put “life in perspective” for them. 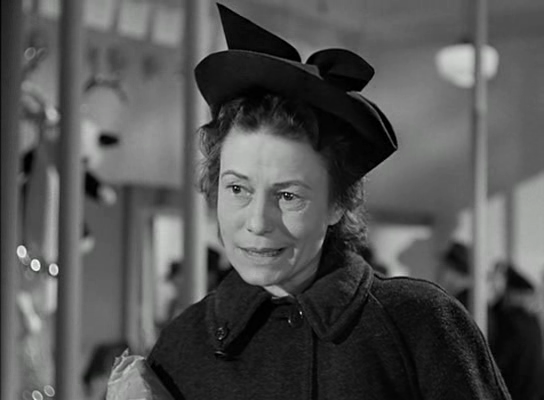 Indeed, the film’s Christmas-time setting is apt, given that this is when the “good-versus-greedy battle within each person” is especially evident — as epitomized by the scene involving Thelma Ritter’s harried mother, whose son wishes for a certain toy she can’t find anywhere (the more things change, the more they stay the same! ); it’s up to Kringle to manifest the true spirit of Christmas by breaking allegiance with Macy’s and telling her precisely where she can go to find one. Of course, one could argue that Kringle’s brilliant “marketing scheme” — co-opted immediately by all of Macy’s significant rivals — merely perpetuates the commercialism so rampant during the holidays. 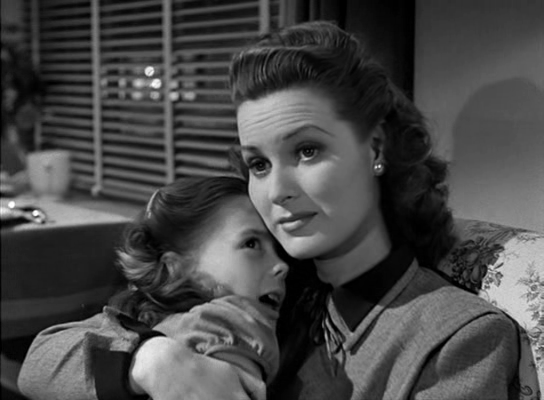 Yet tapping into the power of the “Christmas spirit” is also shown to signify a potentially deeper change of heart: for Maureen O’Hara (Susan’s mom, a cynical divorcee), it means opening herself up to both new romance (with suitor John Payne) and a life outside of the corporate ladder; for Wood, it means learning how to fantasize, dream, and “make-believe” for the first time in her young life. Part of the film’s success lies in the fact that we (especially adult viewers) never really know how much of the story is fantasy versus a manifestation of Kringle’s highly creative take on reality. As a result, we’re left to wonder — is Kringle “really” Santa Claus? And if so, what does that mean, pragmatically speaking? Why would Santa be living in a halfway home in New York, rather than at the North Pole? The mere fact that we’re led to contemplate these questions, however, speaks to the strength and veracity of Seaton’s screenplay — and of the stellar performances given throughout. O’Hara and Payne are well-cast in critical supporting roles, and the entire ensemble cast provides “splendid characterizations”, with “no one play[ing] their parts tongue-in-cheek”. 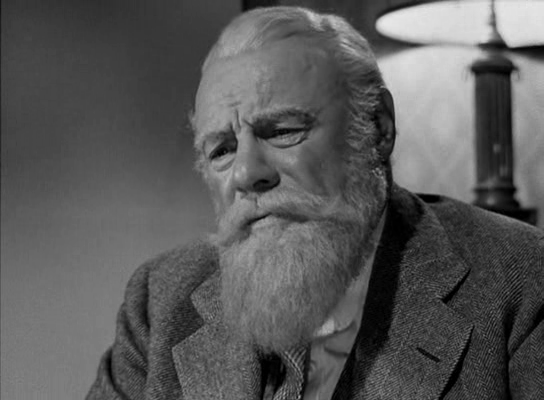 Gwenn, of course, is notoriously “perfect” as Santa (Peary opens his review by stating, “Yes, Virginia, there is a Santa Claus and, using Edmund Gwenn’s SAG card, he gave a convincing performance as himself”). 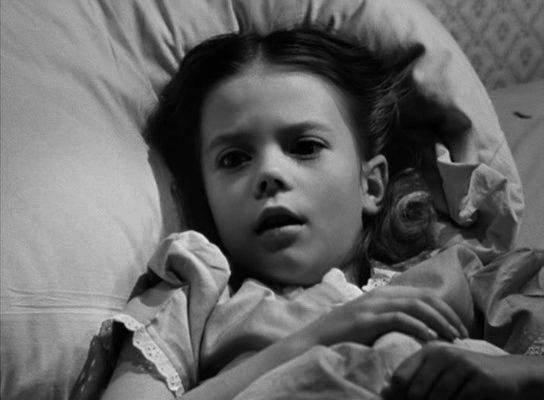 Perhaps most impressive, however, is Natalie Wood, who gives one of the single best child performances ever — watch how convincingly she portrays young Susan as alternately cynical, hopeful, playful, dejected, and overjoyed. Yes, naturally, as an enduring classic. Nominated by Peary as one of the Best Pictures of the Year in his Alternate Oscars. Must-see, as a well-crafted, thoroughly charming fairy tale for young and older ffs alike. From start to finish, this is a very intelligent, smartly directed/smoothly acted Christmas film – which doesn’t necessarily need to be seen just at Christmastime. Though it’s ostensibly about Santa Claus, it would not be that hard to substitute SC for Christ himself; Kris seems not far removed from what Jesus would have been like as a man on Earth. (He can even become irate, just as Christ did at times.) 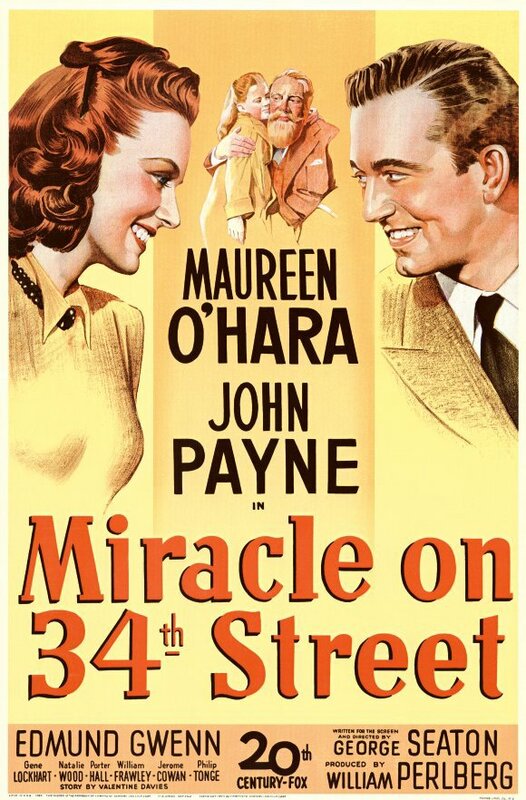 The film’s overriding theme is faith and, as Payne eventually says, “Faith is believing in things when common sense tells you not to.” That seems an odd thing to say, actually, until you realize that no one necessarily needs to believe in Santa Claus. How would having faith in SC change his reality the slightest bit? As quoted here in the statement, Christmas is indeed a “frame of mind”, a way of life, something to follow. But has anyone ever been encouraged to actually…follow…Kris Kringle? Of course, the fairy tale aspect of ‘Miracle’ goes a little whole-hog: I wonder what the real Macy’s store owner thought when he saw his store portrayed as the ultimate in goodwill public policy. And not just Macy’s, but the other major department stores that follow suit in the film. I actually think the ‘new store policy’ depicted in the film makes a good deal of sense. But I can’t imagine that would ever fly. One has to simply overlook the few other elemnts at play here that are too good to be true. Like…O’Hara just happens to be living next door to the kind, understanding, apparently flaws-free hunk Payne. Who…gee…just happens to be madly in love her – warts and all. But, hey…the whole package here is served up in such a delightful manner that it would seem curmudgeonly to deny its more fanciful parts. 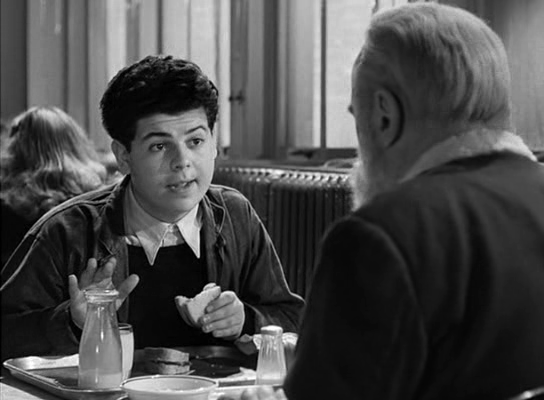 It’s a particular relief that the screenplay brings in a psychiatrist who can offer a second opinion on Kringle (to legitimize a good deal of the film’s second half), as well as a judge (late in the story) who is placed in the very precarious position of what constitutes ‘truth’. The entire cast is top-notch and infectious with charm. O’Hara and Payne have wonderful chemistry. It’s almost impossible imagining anyone better than Gwenn, in what could arguably be his best performance; it’s total! Wood is shockingly good for one so young. Ritter is an extra-added treat in her early cameo. 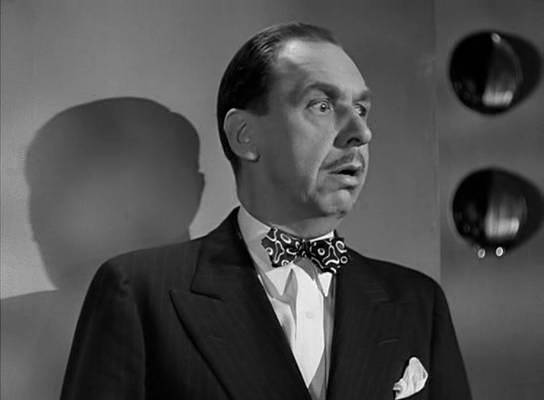 As is Jack Albertson, seen briefly late in the film in a pivotal scene as a postal clerk. Overall, a very uplifting experience and a perfectly soothing confection. How can you not simply feel great just watching it?